The most iconic symbol of San Francisco, the elegant Golden Gate Bridge, still makes my heart swell with pride whenever I cross it, even after hundreds, perhaps thousands, of crossings in my life. I’ve perfected a swivel of my head to let my eye wander across the gateway to the vast, rolling swells of the chilly Pacific Ocean on one side and the intimate, sail-dotted San Francisco Bay on the other, all the while navigating the narrow lanes of the bridge. The graceful arc of the cable still draws my eye up, up, up toward the top of the steadfast towers, mute guards standing sentry to the bay. The color of the International Orange towers are a disappointment to many who are expecting the Golden Gate to be, well, golden, but the bridge is actually named for the waterway beneath it, the Golden Gate Straight. The orange vermillion, a rich, warm color, was chosen to blend with the natural surroundings anchoring either end, and complements the ochre hills in the distance. Built in 1933, the bridge has withstood two major earthquakes unscathed and has only closed once since construction, in 1987, to commemorate its 50th anniversary. I was a part of that celebratory crowd of 300,000 people to surge onto to the roadway during the city-wide celebration, possibly a once in a lifetime experience unless I’m still around for the 100th anniversary. Start at Fort Mason in San Francisco and walk, run, bike or drive through the Marina District over the Golden Gate Bridge to Fort Baker in Sausalito. From Fort Mason to Fort Baker is a distance of 6.2 miles one way. Fort Mason: This fort, part of the Golden Gate National Recreation Area (GGNRA) originally provided defense for San Francisco back in the 1800’s. It now houses an eclectic assortment of organizations, including several theaters and the renowned gourmet vegetarian restaurant, Greens, a culinary institution in San Francisco. The grassy slopes above Fort Mason are perfect for picnicking or sunbathing on a sunny day. Pay parking is available. Marina Green: Walk or drive along Marina Boulevard to the Marina Green, a 74-acre lawn that was once an airfield, to get close to the waters of the San Francisco Bay and admire the views of Alcatraz, Angel Island and the Golden Gate Bridge. 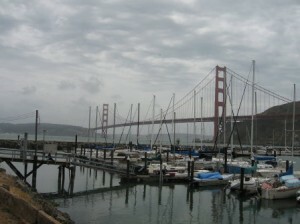 The Golden Gate Yacht Club, current holder of the America’s Cup, is located here, as well as the proud St. Francis Yacht Club. Continue past a small marina to reach Crissy Field. Crissy Field: Originally an airfield (we seem to have needed a lot of airfields), Crissy Field, was part of the Presidio Army Base. After the GGNRA acquired the field in the 1990s it was gradually restored to a salt marsh. It is now a favorite place for San Franciscans to recreate, whether dog walking, jogging or windsurfing against the dazzling backdrop of the Golden Gate Bridge. Fort Point: For a unique perspective, continue on the trails from Crissy Field to Fort Point, a fort located directly under the Golden Gate Bridge. In surround sound, traffic rumbles high overhead, while at the base of the fort mighty surf crashes on enormous boulders. My running route from Cow Hollow used to take me here, and I wouldn’t let myself turn around until my fingers touched the chain link under the bridge. The arched brick casements of the fort, which protected the city during the times of the Civil War, are impressive. The inside of the fort is open Friday-Sunday. Take the Bay Trail up the hill to the Golden Gate Bridge. Golden Gate Bridge: A walk across the 1.7 mile bridge is de rigueur for visitors to the city, delivering unparalleled views of the cityscape, bay, Alcatraz and Fort Point. Pedestrians and cyclists are permitted to cross the bridge on the sidewalk during daylight hours, but not dogs or roller blades. Parking lots are located on either end of the bridge, with a visitor’s center on the San Francisco (south) end. Fort Cronkhite: On the western side of the bridge terminus on the Sausalito side is Fort Cronkite, which anchors the vast, 12,000-acre Marin Headlands. Hendrik Point, off of Conzelman Road, offers one more amazing vista at an old battery, as you stand high above the deck of the bridge and gaze through the cables and towers at the city beyond, a counterpoint perspective to the location under the bridge on the other side at Fort Point. Fort Baker: Below the Golden Gate Bridge on the Sausalito (eastern) side is Fort Baker which houses the Bay Area Discovery Museum, a public pier and Cavallo Point. Cavallo Point offers luxury lodging and dining in a restored US Army post, the suites located in former officer’s quarters. If it’s a normal windswept summer day, softened with swirling fog, and you’re chilled to the bone, head over to the Farley Bar to site by the fire and have a hot toddy. If you complete this entire itinerary you will have seen some of the best vistas San Francisco has to offer, and accomplished many a San Franciscan’s goal, to walk across the Golden Gate Bridge. 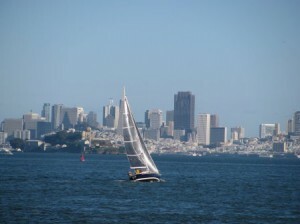 See related article on Locals Guide to the Top 10 San Francisco Attractions. A map of walking, biking and hiking trails located on the south side of the Golden Gate Bridge located in the nearby Golden Gate National Recreation Area and The Presidio, can be downloaded from GoldenGateBridge.org. Information about visiting the Golden Gate Bridge can be obtained from GoldenGateBridge.org. A map of the Golden Gate National Recreation Area can be downloaded from the National Park Service.